When it comes to creating in makerspaces, lots of tinkering, exploration and messing around to figure things out takes place. But sometimes, you want your students to create projects that dive deeper — to use the design process or design thinking to carry an idea to a finished project. One of my favorite design challenges I’ve worked on with students, the Furniture Design Challenge, did just that. This design challenge was done in collaboration with Custom Educational Furnishings (CEF). CEF was beginning to create furniture for makerspaces and wanted to get student and teacher input. Together, we decided to challenge my after-school Makers Club at Stewart Middle Magnet School to create designs for makerspace furniture items. The students would present their ideas to representatives from CEF, who would then choose one design to manufacture and add to their line. 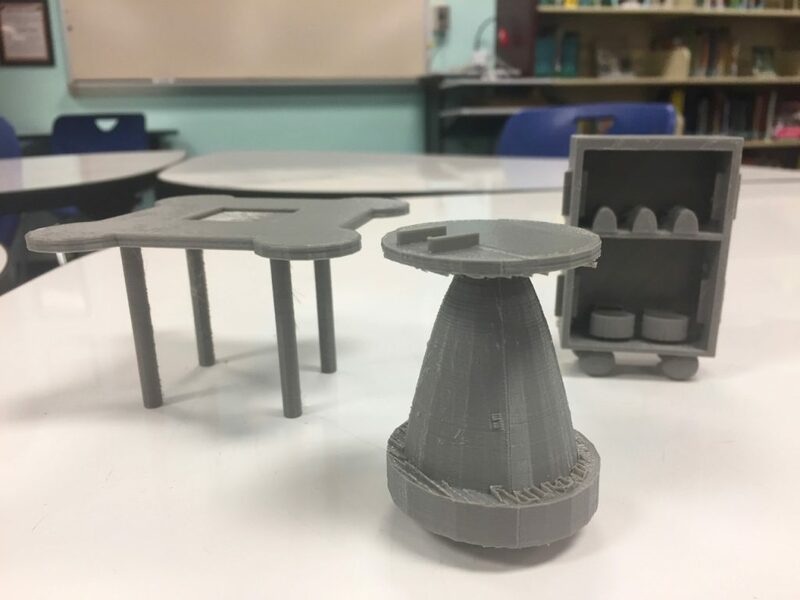 Working by yourself or in groups, create a design for a piece for furniture that would help another school to start a makerspace and/or that would make our makerspace better. You can use any materials and you’ll have three club sessions to work on your design. You’ll then pitch your idea to a representative from CEF, who will choose one design to manufacture. Creative Constraint: Your idea must be something that could actually be feasible in real life. This was a pretty special event and not something that you get to do every day, but there are many elements of the Furniture Design Challenge that any school can do. It’s a great way to bring student voice into your makerspace and get a better understanding of how students use your space. With any design challenge, you want to start with thinking about what problems you’re trying to solve. The students in our Furniture Design Challenge began looking around our makerspace at what problems and issues were happening. They interviewed other students about their experiences. They observed students using the makerspace to look for trouble areas. This stage of the design process was very important because we didn’t want to just design things that looked cool or impressive — we wanted to design something that would make the makerspace (and other makerspaces) better. We didn’t have a good place to use hot glue guns. They often ended up on the floor, dripping glue on the carpet or melting onto cardboard. This created a fire hazard, and it was also pretty uncomfortable for the students to use them this way. In part, this problem arose from the lack of available outlets (which is another problem to solve). The Perler beads never stayed organized for very long. No matter how often we would re-sort them by color, they would be mixed up before long. When students worked on designs that required certain colors, they had to dig to find the beads they needed. The four Sphero® robots and five iPad® tablets that we had were housed in separate areas, even though we used them together. The Spheros had to sit on a shelf to charge. There was no way to transport them to other areas of the library without taking them off the charger, and it was inconvenient to lock them up over the weekend. We had several large storage carts that we could move around the library, but we didn’t have a smaller, more maneuverable cart. We also didn’t have a good storage solution for smaller tools and materials. The 3D printer was housed on a shelf behind the checkout desk. Because of where it was located, only two or three students at a time could stand around it and watch it. My students wanted to be able to accommodate more student viewpoints. Once they began to identify the problems they were trying to solve, my students began brainstorming solutions. They started out by sketching their ideas on butcher paper and whiteboards. They discussed their ideas with one another and worked on refining them. After some time spent brainstorming, they started to build their prototypes. Some students built models of their furniture with cardboard and glue, and others cut and folded paper. Some built their ideas with LEGO® and K’NEX® pieces. 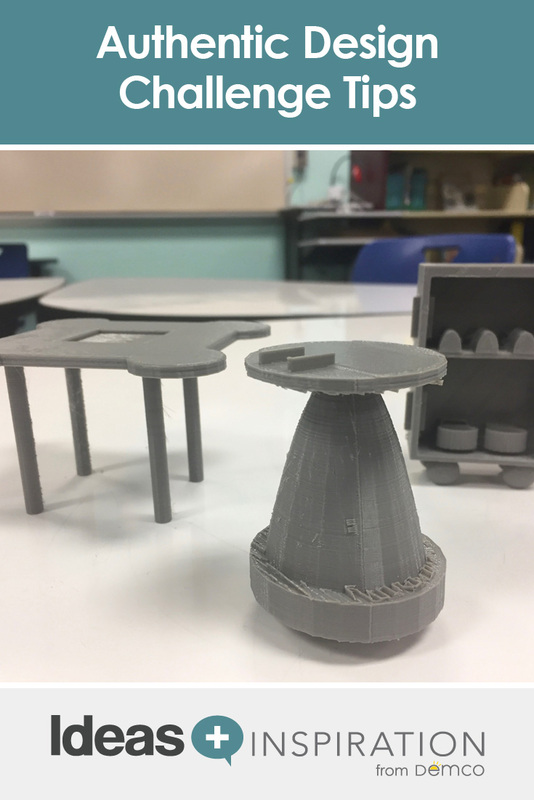 Several students took to Tinkercad to create 3D models of their designs, which we then printed out on our 3D printer. As the models began to take shape, we displayed some of them in our library. It was like a makerspace doll house, but way cooler. The most exciting part of our Furniture Design Challenge was being able to get authentic feedback on our designs from CEF. The students pitched their solutions to Nichol from CEF, showing their diagrams, blueprints and models. She asked great questions to get them to describe their design process. She explained details about manufacturing, like how the company would have to go about sourcing magnets, making things height adjustable or offering whiteboard surfaces. Most importantly, every student felt validated. It’s so important for students to have someone other than their own teacher or librarian recognizing the value in their designs. I do realize that it isn’t feasible for every school to have a furniture company come out and offer feedback on student designs. But that doesn’t mean you can’t get authentic feedback. Reach out to some companies to see if they’d be willing to hold a video conference with your students. Ask around at local businesses such as office furniture stores, architecture studios or interior design offices. See if you have any engineers or designers among your school parents. It will take a little more effort, but it’s totally doable to get authentic feedback from outside sources for your students. Explore storage solutions like the CEF Stewart Storage Cart that will keep your space organized and your students productive. Depending on how complicated your students’ ideas are, they may or may not be able to build a completed product that you can use in your makerspace. As much as my students would have loved one, it wasn’t feasible for us to build a storage cart with flamethrowers on it. We were lucky to have our amazing partnership with CEF, which resulted in the manufacturing of the Stewart Storage Cart. That very first cart is now a part of Stewart’s makerspace. Consider other ways that you can bring your students’ ideas to life. Maybe you can partner with a local makerspace to create a file for a laser cutter for a student storage shelf design. Or perhaps you can do a “furniture take-apart” version of tech take-apart, where you source old furniture items, take them apart and rework them into something new. You might even do some IKEA hacking, where you take furniture from the popular store, combine different items and create new designs. Or you might consult your students on the design of your library and/or makerspace. Can they identify any problems with the flow of your space? Do they have ideas for making things more accessible? Have them brainstorm, design and then pitch you their ideas. They’ll probably come up with some impactful changes that you can make relatively easily. Challenge yourself (and your students) to think outside the box — you’ll be amazed at what can happen. For more details on our Furniture Design Challenge, watch the video below.